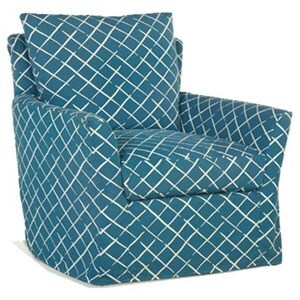 This vibrant Swivel Glider chair is sure to make a statement with its vibrant patterned slipcover called Solar Onyx. 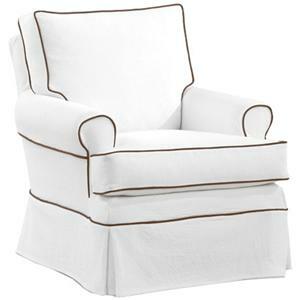 The one piece removable slipcover is made from 100% cotton with top stitch detail. The glider comes standard with feather down blend seat and back cushions for an ultimate sense of comfort. The Porter F Upholstered Swivel Glider Chair by Four Seasons Furniture at Jacksonville Furniture Mart in the Jacksonville, Gainesville, Palm Coast, Fernandina Beach area. Product availability may vary. Contact us for the most current availability on this product. A contemporary solution for the modern lifestyle, the Porter collection is sure to become a success in your home. Clean cut lines make up the silhouette of each piece, while plush, down seat cushions and pillows make this a collection of comfort as well. Blends of cotton and linen give it that homey feel desired for every home. 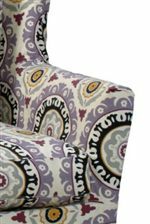 With a play of neutral fabrics with punches of vibrant patterned pillows and accent chairs, this collection is simply a perfect balance of fun and modesty. The Porter F collection is a great option if you are looking for Contemporary furniture in the Jacksonville, Gainesville, Palm Coast, Fernandina Beach area.